WILLEMSTAD - The excitement is steadily building as the Caribbean’s best junior athletes begin their final preparations for the highly anticipated 2017 Flow CARIFTA Games in Curaçao. More than 600 athletes and officials representing 26 countries are expected to descend on the multi-purpose Ergilio Hato Stadion in the capital city of Willemstad for the traditional Easter Weekend championships between April 15 and 17. 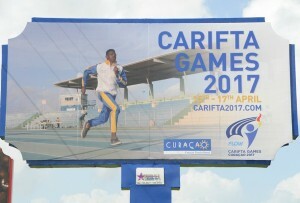 “This is the second year of Flow’s partnership with the North American, Central American and Caribbean Athletics Association (NACAC) and we are once again happy to be delivering greater opportunities to our young athletes at superfast speeds,” said Wendy McDonald, Flow’s senior director of communications - consumer group.